It has been a bit quiet around here since before Christmas and so nice to step away from social media for a couple of weeks. I have so much planned for 2018 and would love to share some of our projects on the way. I always loved joining in with My Sunday Photo and spent a good while on a Sunday morning seeing what everyone was sharing, this is one of my aims for this year, I just need to plan a little better. 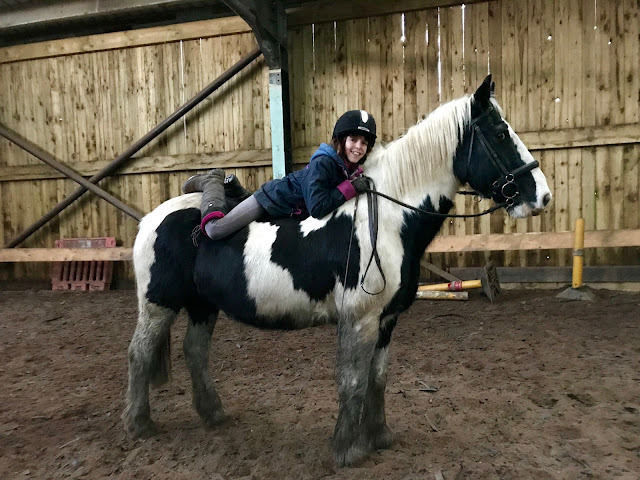 My photo is of Gee and her pony Jake, as you can see he is a gentle giant, that is compared to our other pony Maisie, she is rather headstrong and naughty and times. But Gee is only happy when with the horses, she can communicate with them in a way she cannot with other children. He looks beautiful, and the best of friends. I remember being just the same at her age. Ahh! They look so comfortable together....Fab photo. What a gorgeous photo. Gee looks so happy there.